Manage Wii backups on your external hard drive and more..
Gamecube ISO tool is basically what the name suggests. You can use it to convert between various Gamecube formats for backup purposes or playing on most USB loaders via Dios Mios Lite. The main purpose of GCIT is as a testbed for gamecube functionality in Wii Backup Manager, but I've tried my best to also make it a usable standalone application. See below for the change log, list of features and command line options. Read and write Full size (scrubbed) or trimmed ISO/GCM, GCReEx and DiscEx formats with direct conversion. Extract games from GCOS multiboot ISOs to any of the supported formats. Command line options for batch processing etc. Save the original file layout to trimmed ISOs, allowing full size ISOs to be rebuilt at a later date with the same file layout as the original. Fixed: Loading GCReEx from a folder was broken, showing extra entries. Fixed: A couple of small bugs that could cause errors while converting. Fixed: Games starting over the 4GB boundary on GCOS DVD9 discs were showing as invalid. Fixed: Loading backup FST over 32KB didn't work. Fixed: In the update dialog, there was no scroll bar in the change log. Fixed: I forgot to remove special characters like ":" from the default filename in the dialog when saving ISO. Fixed: When uploading the log to the Ctrl-V website, the document title should've been "GCIT log" instead of "Ctrl-V log"
Source is either an ISO filename or folder in GCReEx/DiscEx format. All options are case insensitive. Quit after the operation if there's no errors. Quit after the operation even if there's errors. Flush the file buffers so that the SD card can be ejected almost immediately after the operation. Save a backup of the original fst.bin and boot.bin files inside the trimmed ISO. Set the alignment used in the ISO. 4 bytes, 32 bytes or 32KB. Default is auto. Set the destination format. Default is Trimmed ISO. GCReEx and DiscEx formats expect a folder. The ISO formats expect a filename. When extracting games from a GCOS multiboot disc, a folder is expected regardless of the output format. Default is a file or folder called "out" in the same folder as the source. 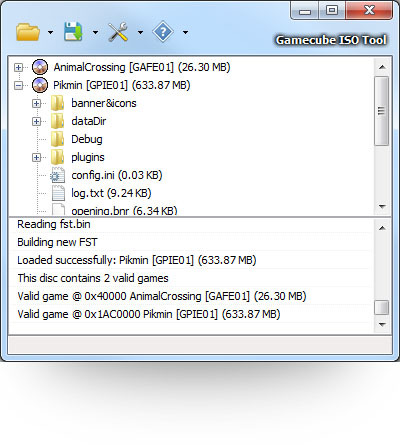 gcit game.iso -q -flush -f FullISO -d "c:\folder with spaces\full.iso"
gcit multigame.iso -q -f discex -d "e:\games"